Sometimes, when I'm craving a $$ drink from the 'Bucks, my frugal side actually gets the best of me. The evidence of that fact is my "Iced Vanilla Black Tea." 1.) 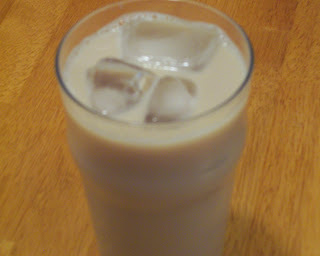 Pour tea, soy milk, & vanilla syrup into a glass. 2.) Add ice, stir, & enjoy! *Variation: You can use any kind of flavored syrup that you like - or just stick with plain old sugar.